Fast, accurate, mobile drug testing for law enforcement and industrial workforces around the world. LE5 Drug Tester technology incorporates state-of-the-art liner Detector Arrays and a patented Optical Filtering System to deliver accurate and fast drug test results from just 90 seconds. Results are clearly defined and displayed so the user is not required to interpret the presence of a line like other test devices. 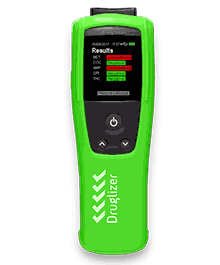 Delivering outstanding display and response times in an ergonomic package, the Druglizer LE5 Series continues the Alcolizer Technology tradition of ground-breaking technological development delivering advanced solutions for our customers. An impressive array of connectivity options is available – from cloud-based data with AlcoCONNECT™ Live when combined with the free Android app AlcoCONNECT™ mobile, USB data download with AlcoCONNECT™ Toolbox and Bluetooth printing. In a world-first development, the Druglizer LE5 features a modular system that enables calibration to be completed on-site in around 60 seconds, minimising down-time and increasing the instrument’s availability for testing. Proudly designed, developed and manufactured in Australia by Alcolizer Technology – manufactured to the highest quality standard ISO:9001 and in accordance with Australian Standards Certification AS 3547 Type 2*. Rated as one of the best breathalysers on the market today – for use by police forces in Australia. Unbeaten connectivity options – cloud based data with AlcoCONNECT™ Live, USB data download with AlcoCONNECT™ Toolbox and bluetooth printing. For industry professionals who want a serious breathalyser for peace of mind. Alcolizer LE5 (LE5) has a highly responsive electrochemical fuel cell that delivers fast and accurate results in sophisticated, law enforcement and heavy industrial use applications. For more information on the Alcolizer LE5, click here. *Australian Standards Certified for Standard tests when Alcolizer approved mouthpieces are utilised.